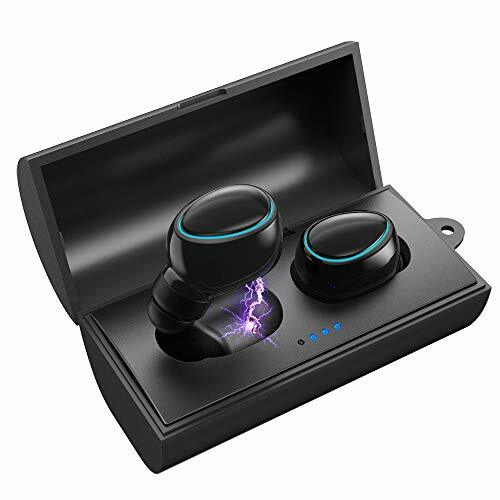 Use the latest bluetooth 5.0, when two earbuds power on, they will pair with each other automatically.Do not afraid the two earbuds lost connection as other version true wireless earbuds. Build-in 40mm 16S copper speakers,widly gamut,perfect fitness for pop music,Rock&Roll,Jazz...., in our lab test, such as Despacito,See you again,Shape of you,Beat it...these pop MV and songs in Youtube, this earbuds work with them very well, as if be personally on the scene. 1.Share Mode --Give one earbud to your lover/familiar/friend, share your happiness at the same time, your two can hear same music, watch the same TV. 2.Single Mode -- This pair TWS earbuds can work separately, just work as two single car wireless earbuds, each of the earbuds can connect with deffirent smartphone, listen the deffirent music and so on. the earbuds will back in initialization mode, wait for 2-3 seconds, the two earbuds will pair with each other successful. If the two way can not work or other questions, please contact our support team. ✿【True Wireless & Auto Pairing】--- Truly bluetooth wireless headphones, no cord, no limited, free ear for any cable mess; "Share" mode allows us to enjoy same video and music with partners; At default,two mini earbuds will pair automatically when pick out from charger box or power on, never worry double earbuds will lost connection; If just power on one earbud, also can use single mode if you need. If you have any questions about this product by SUPOLOGY, contact us by completing and submitting the form below. If you are looking for a specif part number, please include it with your message.